Did you know there used to be a race track in Barnet? 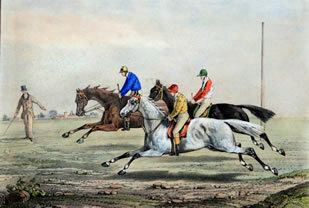 By the mid 18th century Barnet fair had become associated with horse racing and races were held on the last three days of the event. The course was where the present High Barnet station now is and newspaper advertisements exist from 1751 onwards. Because the fair was popular and with large amounts of money available crime became on the increase and there was a lot of illegal gambling, the 1756 guide to Barnet races routinely recorded cockfighting results. This did not go down well with the Barnet association. Local associations were a standard response to law and order problems, and one was therefore formed in 1792 to cover Chipping and East Barnet. Its aim was the capture and conviction of offenders, and it was deemed so successful that in December its area was extended to cover Hadley, South Mimms and other adjacent parishes. The Association's role, though, was limited to fund-raising and lobbying, and enforcement continued as before. Policing in London was overhauled in 1792, but Barnet was way outside. Local associations were a standard response to law and order problems, and one was therefore formed the same year to cover Chipping and East Barnet. Its aim was the capture and conviction of offenders, and it was deemed so successful that in December its area was extended to cover Hadley, South Mimms and other adjacent parishes. The association's role, though, was limited to fund-raising and lobbying, and enforcement continued as before. Hadley, which had appointed paid watchmen in 1786, was doing so again in the 1820s. And they must have been relieved that the course's heyday was short lived. In 1867 the GNR laid on special trains on the mainline, but in 1871 the new suburban line and station were being built across the track. 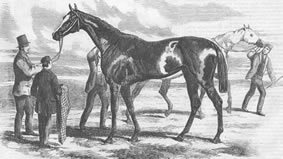 The last race held there was "The Barnet Stakes" on September 6th 1870. and it featured only three events, of which two were walkovers, while in the third only three horses ran, of which one bolted. In 1888 the non-resident lord of the manor petitioned the Home Secretary to close Barnet Fair, but it was still such a vital part of the local economy that he had little support. Some innkeepers reckoned to cover the whole of their annual rent with the fair takings pointing out that around 40,000 cattle changed hands during each fair, and that drovers and dealers, as well as other visitors, spent considerable sums locally. To see the famed races of Barnet.